Toady marks the passing of a great person and extraordinary inventor Wilson Greatbatch at age 92.. In my book he deserves recognition as one who lived a magnificent geezerhood. 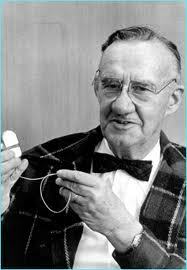 He continued to be an active inventor throughout his entire life with over 350 patents. But perhaps more important than his specific inventive successes was his zest for life. His curiosity and generosity of spirit made him a most delightful person to encounter. I was fortunate during my years at Cornell to enjoy some time in his presence in personal conversation as well as listening to him lecture on his development of the heart pacemaker and associated long life batteries. At that time he had also become interested in developing a cure for AIDS and was putting his inventive and innovative genius to work in exploring new ways to deal with this disease. Although he was world re known at the time I met him, he was unusually humble and genuine in his demeanor. There was not a pretentious bone in his body. I am saddened by his death but at the same time rejoice in his contributions to humankind and his example of appreciating the gifts God had bestowed on him. I would hope that all of us in geezerhood would be as kind and generous as Wilson Greatbatch. Condolences to the Greatbatch family as they both celebrate and mourn the passing of a father, grandfather and great-grandfather who lived an exemplary life for all of us.